Most of you are familiar how Magento product tags work. They are scoped by store, can be added by both customers on frontend and admin in backend, they have to be reviewed and approved, etc. Sometimes, depending on a situation, there’s a need for a different approach. Sometimes there’s a need for tags to be store independent. I was in the situation like that, where I needed tags to be global, but to have an ability to translate them by store if needed. With this approach it’s a hassle for the customers to add translated tags which is why the add new tag functionality is omitted on frontend. 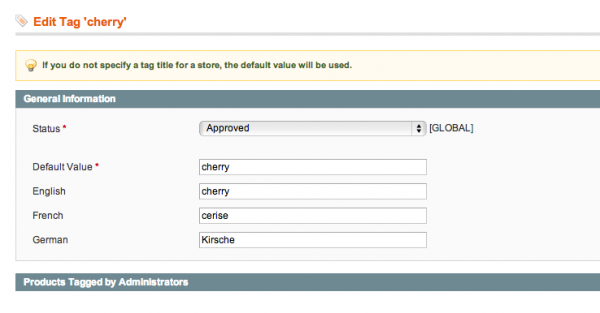 Also, there’s no need to have pending tags anymore when only the admin is the one that can add, modify and delete tags, associate them with products and translate them by store (see the image below). All the tags, even the already added, are handled as global. As there’s no need anymore to review the pending tags, pending tags grid is removed. If some of the current tags are marked as ‘pending’, they will be still visible in the main grid and can be filtered by their status if needed. There’s still some room left for new features (such as tag visibility by store) but it will come in one of the next updates. I hope someone will find this useful. Hi! I’m experiencing problems with languages. Product collection retrieved when linking a tag (/tag/product/list/tagId/ID/) is in different language from store view! First comment! Thanks for the extension, very useful.